Gain insights into the profitability of your social media efforts and activities. Analyze the ROI for each of your accounts and mentions. Monitor your competitors to understand your relative position in the market. Analyze your brand and competition in an easy and visual way. 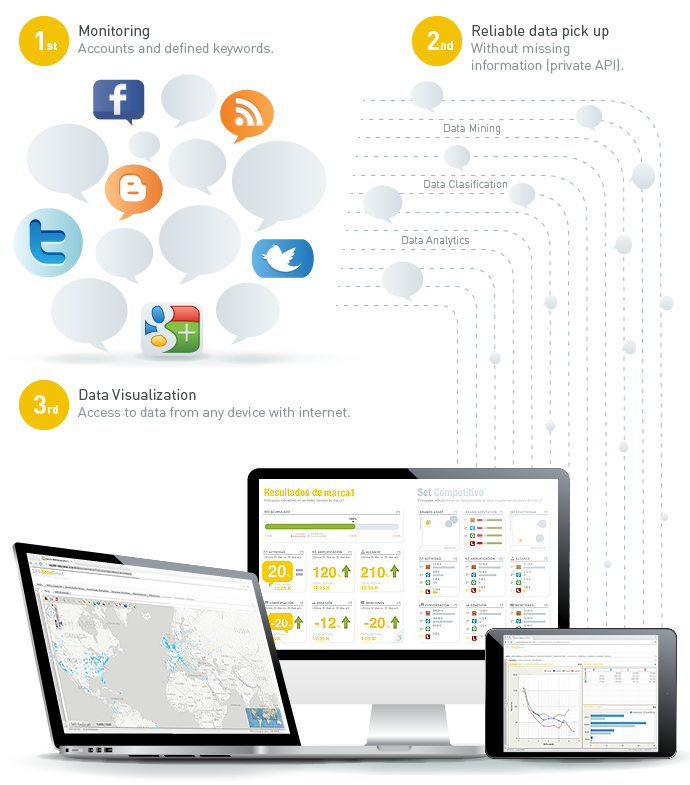 To learn more about DKS SocialSmart and check the features and benefits of our social analytics product, contact us. DKS SocialSmart is a social analytics tool that measure and analyzes a brand’s social media commentary and activities. The platform uses leading edge indicators that enable measure of a brand’s performance as well as comparison with competitors. DKS SocialSmart also measures the ROI of social media campaigns and activities in a simple and easy way. DKS SocialSmart uses reliable data and gives you the confidence that you’re never missing a single social comment or action. Adapts to company needs, and segments users as desired. Looks for any news, publication or content about a brand across the web for detailed analysis. Filters all indicators by plataform, account, competitor and more. Clear and understandable data visualization with interactive graphics that are modified according to filters. Automatic generation and delivery of customized reports, saving time and enhancing decision making.